First, it was HSR, then Koramangala, and now, finally, Indiranagar gets its own Instagram fad — the black ice cream. Created for people who want something badass instead of the usual white-as-an-angel vanilla scoop or a plain Jane chocolate ice cream, this icy treat is dubbed the Stardust Vanilla at Mama Mia!.It’s located on Double Road, near the 12th Main Junction, and it has taken French vanilla ice cream and turned it into a Wednesday Addams-approved black version by infusing it with activated charcoal. 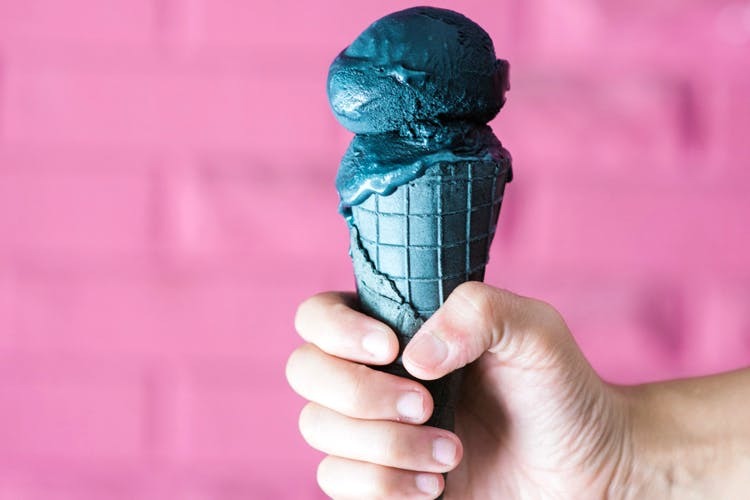 Served in a black waffle cone, this black icy treat is your first step towards nailing that goth look. Indiranagar peeps, it’s time to ditch the colours and go black! We tried the rest of the menu, which you can read all about here. Sicily Lemon, Cookie Sandwich & Black Ice Cream, This New Sweet Spot Is Serving Us Scoops Of Yum!